Sony has unveiled two officially licensed third-party PS4 controllers, designed specifically with eSports in mind, via its PlayStation Blog. 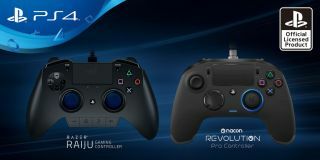 As an added bonus, both have names which make them immediate contenders to win the next series of Robot Wars: the Razer Raiju, and the Nacon Revolution Pro. The Razer Raiju looks a like it might transform into a small warplane and take to the skies at any given moment, but offers practical features too. It's got two extra bumpers and two extra detachable triggers, a built-in control panel on its front, and "trigger-stop switches and hair trigger mode for ultra-fast trigger responses". No, you may not make an Only Fools & Horses joke at this point. It also enables you to immediately switch between two custom profiles, boasts detachable rubber sticks on its analogue sticks for extra grip, and comes with a 3m-long USB cable – just in case you want to play from the hallway, using a complex system of mirrors. The Revolution Pro is also going all-out to deliver snazzy features. It packs four extra shortcut buttons, an eight-way D-pad, the ability to create four custom profiles (to re-map buttons, for instance), and 46° amplitude dual analogue sticks. "Two internal compartments with six additional weights" apparently give it extra sturdiness in your hands, while it too also offers a 3m-long USB cable. Sony says both controllers contain all the usual DualShock 4 features, too. They're on sale in Europe before Christmas, and as soon as a US release date is announced GR+ will share that here.